Reduce Costs. Save Space. A single outdoor unit can efficiently cool two rooms. 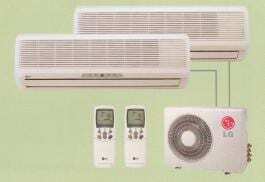 LG Multi Type Air Conditioners can operate two units at the same time, with two separate, individual wireless remote controllers. The Jet Cool function allows quick cooling. In this mode, strong, cool air is blown at high speeds for 30 minutes, until the room temperature reaches 18 degrees Celsius. 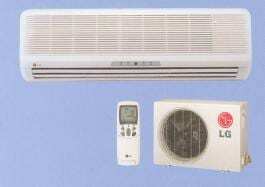 To provide a comfortable, pleasant and well balanced environment, LG air conditioners utilize a streamlined air fan and a unigue design which sends a smooth air flow from the air conditioner operating under the lowest noise level. LG Mini-Split System offers modern styling and ultra-quiet operation. 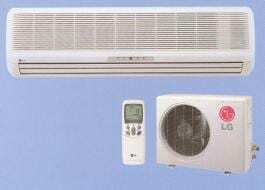 Thanks to its “easy maintenance” design, LG provides an excellent value in a high-quality, ductless system. The Jet Cool function allows quick cooling. In this mode, strong, cool air is blown at high speeds for 30 minutes, until the room temperature reaches 18 degrees Celsius. To provide a comfortable, pleasant and well balanced environment, LG air conditioners utilize a streamlined air fan and a unigue design which sends a smooth air flow from the air conditioner operating under the lowest noise level. Welcome to our refurbished website! Here you will find news about special deals and other interesting stuff. Please check back often. "I was stuck this winter with no heat n know one was able to get hear for weeks then I got community gas # from a friend n John n his crew was hear in days was very respectful n easy to talk to offered me space heaters to borrow if I needed till he was able to do it not to mention he was the best priced out of all them when my ac went I had no doubt who I was calling lol John was hear next day hands down best heating n ac guys around thanks guys." John gave us excellent service, he responded quickly, was very professional and is a really nice guy. He had our air conditioner functioning optimally in no time and even followed up with a call tonight to make sure we were happy. I would highly recommend Community Gas & Mechanical Services! Thank you John for being so generous with your time. We truly appreciate you coming in to figure out what was wrong with our furnace. We are happy to say it is no longer 59 degrees in the house back to a toasty 70. Your service is amazing we will definitely be contacting you in the future and will recommend you to all who ask! John and his crew are fantastic! He’s helped us with s new fireplace installation, gas line for our stove, swimming pool etc. We rely on his expert advice and counsel! We highly recommend Community Gas to everyone! Would like to Thank John for his services last night (Dec 30). Had renter's at my cottage in Collingwood. Furnace was not working properly. Thermostat had to replaced. It was after midnight and John went above and beyond the call. He fixed the problem. I was happy. Renter's were happy. Thank you John for what could have turned out to be a disaster. We had our gas fireplace installed today. John is professional, on time and we are very pleased with the result. His crew were amazing and we are so happy we decided to have this fireplace put in by him. Had our furnace replaced a couple of years ago and were impressed by him, hence the fireplace. We recently had a furnace and A/C installed in our cottage at Wasaga Beach. After several quotes, we went with John and are so glad we did! His provided us with a detailed outline of what he would provide and the work that would be done, all at a fair price. The work was extensive as we needed to have duct work installed as well. Joan, Mark and Justin were all very professional and took great pride in their work. I would highly recommend them. John, Justin & Mark were amazing. I highly recommend this firm. I had a couple of quotes in to replace my furnace and it so nice to deal with an honest tradesman like John & his crew.